What is the utility of creating a full-depth Visual Sitemap? I’m a programmer that is new to UX and have a potential web project that has probably ~5k pages. What type of information could I take away and benefit from this tedious exercise? I agree with the above response conceptually..however, using the right tool to automate the tedious task of generating a visual sitemap of 5k pages would perhaps be both a more efficient and thorough solution for your needs. You don't want to have a full sitemap of 5k pages. You want a summarized view of your website. Below is a sitemap I had to do for a website. The list has a pagination, so many pages can be displayed in this one. Showing too many complex interactions or links between page is not necessary. You should have a clear understanding of the website's structure when looking at the sitemap, but it's not necessary to be exhaustive. Not the answer you're looking for? Browse other questions tagged info-visualisation information-architecture sitemap information-design or ask your own question. How to navigate through a type (1 to 5) > a list (1 to many) > a sub page(1 to 10)? 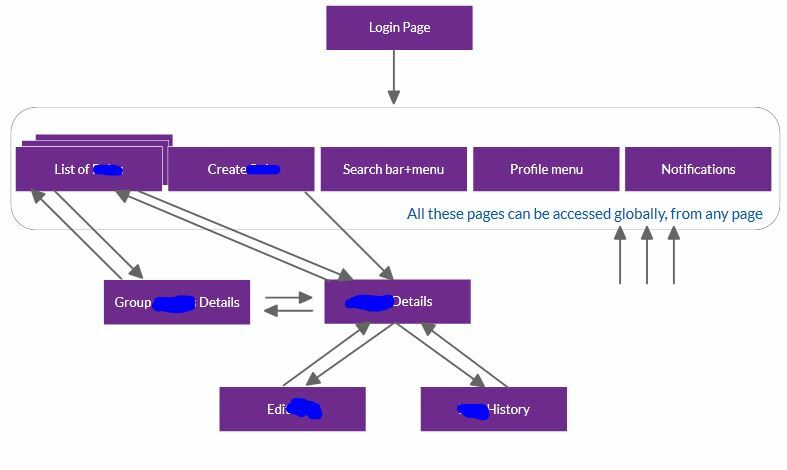 What is the best approach for a sitemap for a very large website? How do I handle duplicate content in the site structure? Keep long form, or separate into multiple steps? With 4 different user type: should I create a site map for each user? When should a web application be avoided in favour of a website?